Keeping oneself busy is an overwhelming task to many students in high school. To the few students however, they are the ones that the majority looks up to for inspiration and motivation. Hope Guzman, SAS Senior, is one of those few people who have been taking their high school career to the next level. During her time as a Hollywood High Sheik, she has sought to “achieve the honorable” as the school motto says. Perhaps one of her greatest accomplishments is the formation of Happy Hands Club. During her 9th grade year, Guzman’s advisory teacher, Stephen Lange, assigned to his advisory students a project that would give them an occupation throughout high school. Originally, Hope wanted to do Mandarin Chinese. However, due to a lack of resources, she abandoned the idea. Then she found an alternative, sign language. A year later, she began to pass around a petition to start a sign language club during lunch. After getting enough signatures, she was ready to establish the club. With the help of SAS social studies teacher Juan Burciaga by becoming the sponsor of Happy Hands Club, she established her club in his room. In order to teach her club, she learned sign language by using a book she borrowed from the Hollywood High School library. She also researches sign language online through a website called signingsavvy.com. “I do research on the topic and practice the material I am going to teach them,” Hope Guzman says. Hope was the president of Happy Hands Club during the second semester of her sophomore year and throughout her junior year until she handed it to Gaby Sosa. Not only is Hope Guzman the creator of Happy Hands Club, she also spends time each week attending the garden project. In the 10th grade, Guzman began volunteering Just Hollywood Just Food Garden. There she learned how to care for plants and how to construct a garden from the ground up. After a year, she “fell in love with gardening,” Guzman said. One day, Guzman heard from the announcements at school that a garden project, lead by Joseph Mendizza, was starting for those who needed service hours. 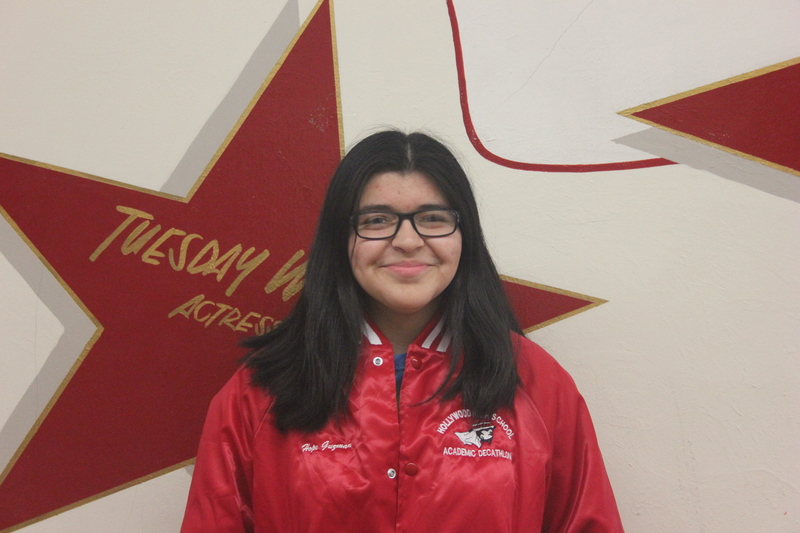 Guzman could not resist the opportunity, and joined the Hollywood High garden project during her junior year..
After a year in the garden project, she continued to volunteer for the school garden and became the lead student , who manages the operations of the garden. Guzman has high hopes for the school garden. “I want the garden to work with F.A.M.E. [and] make the garden more community oriented,” Guzman said. Her endeavors doesn’t end there. Guzman also attends the school’s Academic Decathlon, led by Science teacher Lee Tuomala. Guzman was interested in joining decathlon in hopes to learn more subjects. “I love to learn,” Hope Guzman said. Students in Academic Decathlon are handed out huge packets that contain the learning materials required to compete in the decathlon. Guzman enjoys learning from those packets. Hope Guzman is placed in the scholastic team of the Decathlon team. “We all form a bond,” Hope Guzman said about her fellow colleagues in her decathlon team. Guzman hopes to achieve a gold medal in economics in the decathlon event. Hope has an older sister and an younger brother. During her junior year, it was the first since elementary that both her siblings were in the same school. Guzman’s mom is an elementary teacher, and motivates her achieve well in school. “They’re important to me,” Guzman said. Her goal for her family is to not fall behind, on the shadow of her sister, who graduated last year.